Introduction to physics: Children are exploring how things move in the world around them. They will investigate how they can change the speed and direction of objects by exerting more or less strength. Objective: Children will investigate different forces, push versus pull, by thinking about how they can make an object move. Objective: Using soda bottles and a ball, children will discover that when objects collide they push on one another and can change motion. Objective: Children will experiment with changing the speed (using different strengths) and direction of an object by pushing or pulling it. Objective: Constructing a ramp, children will explore how they can increase the speed and distance of a matchbox car. Objective: Examining real world objects, children will sort objects into groups (push, pull, or both) using a Venn diagram. First, connect motion to what the children already know. Ask them, How do we move? Have children raise their hand and demonstrate. Next, drop a stuffed animal on the ground. Ask students, How can I make the stuffed animal move? They will think about their past experiences with moving objects to derive an answer. Then, explain that a push and a pull are both forces. Force makes an object move or stop moving. When we push something, we are moving it away from us. When we pull something, we are moving it closer to us. [Act out motions: push = palms out, push away from body and pull = two fists on top of each other, pull toward body with students]. Brainstorm: Create a T-chart, write down objects that can be pushed or pulled (objects at home, in the classroom, on the playground). PUSH: Soda Bottle Bowling: Children experiment with pushing a ball hard and soft to knock over soda bottles. They can compare a big push to a small push. What kind of push made the ball move the fastest? They will see how when objects collide (ball and soda bottle) they push on one another and can change motion. PULL: Chair Pulley: Loop a light weight rope around the back of two chairs. Hang a small basket within the loop to send back and forth by pulling. They will experiment with pulling the rope hard and soft. What kind of pull moved the basket the farthest? PUSH: Ramps and Matchbox Cars: Children create ramps using flat, rectangular wooden blocks and duplo legos. They will investigate how the height of a ramp can change how fast and far their matchbox car can go. They will also compare the distance and speed of the car on the ramp to using no ramp. PUSH / PULL: Sort: Put out a paper bag consisting of various real world objects. Children collaborate and sort the objects using a Venn diagram (hula hoops). Children distinguish the objects putting them into groups: push, pull, or both. 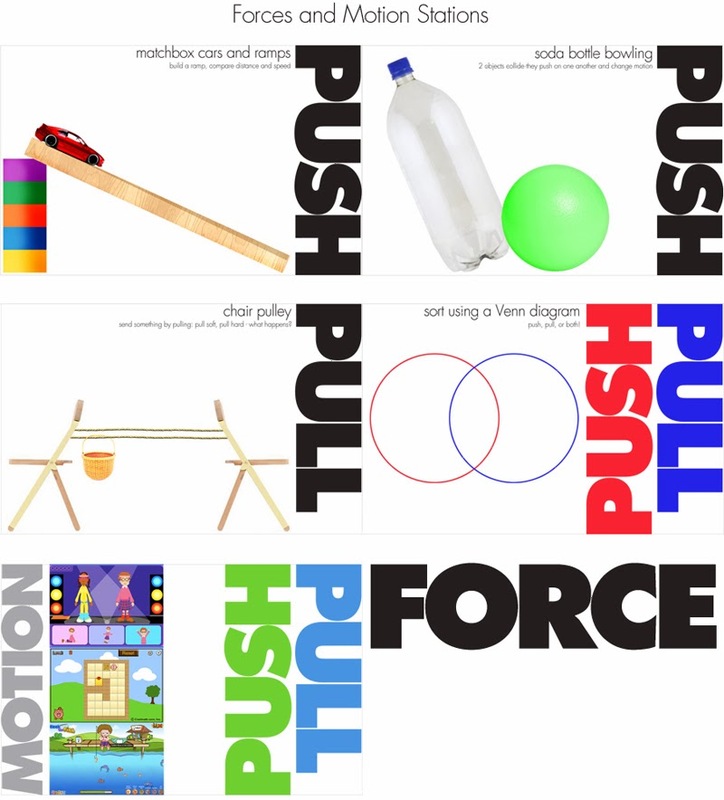 PUSH / PULL / MOTION: Computer Games: Children play games to reinforce push, pull, and motion. Watch a video to reinforce pushes and pulls. For further reinforcement, the next day, have children go on a scavenger hunt and try to find things around the classroom that they can push and pull. When the students are working with the ramps and cars, are they pushing the cars down the ramp? or just letting go of the car from the same point on the ramp/wood block? I am having difficulty understanding that push motion... Please reply soon. They gave it a push.